The small reinforced structure we all know as the pillbox is probably the most familiar type of 20th century defensive building in Britain. 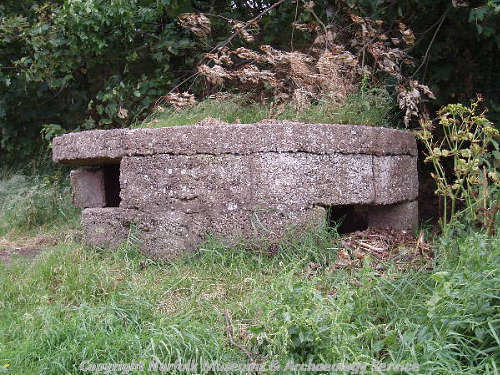 Essentially a response to the development of the machine gun, concrete pillboxes were first used by the Russians in the Russo-Japanese War, and the concept was copied to formidable effect by the German army in World War One (1914 to 1918) on the Western Front. British military engineers were quick to realise their worth, and they became an increasingly important component of Britain’s coastal defences from 1916 to 1918. However, it was during World War Two (1939 to 1945) that the pillbox really took off, and in 1940 alone, some 18,000 were built. During this period the pillbox was mainly associated with beach defences, anti-invasion defensive stop lines and 'nodal' points (i.e. important junctions and airfields), although some were placed to defend coastal batteries, airfields and radar stations. They were now part of an integrated invasion defence system, positioned to interlock fields of fire with other boxes, and associated with other defence systems including tank destruction blocks, anti-tank ditches and scaffolding, road blocks, barbed wire and mined areas. Pillboxes in World War One were usually of a round or hexagonal shape (see below). However, in World War Two, the War Office issued designs for some dozen standard pillboxes to meet the needs of an anti-invasion defence. The variations in shape of these standard designs usually reflected the kind of weaponry they were to contain and their proposed location. In practice these standard designs were seldom followed to the letter, and a large number of variations were incorporated to allow for local availability of materials, tactical considerations and individual preference. Despite these variations, (official and unofficial) pillboxes retain a range of common features. They are nearly always under two metres high, of squat, heavy construction, and usually flat roofed. Normally they are four sided, polygonal or round in plan, with an entrance (sometimes two) away from the anticipated direction of attack, often protected by a porch or blast wall. Main structure walls vary in thickness between 23cm to over a metre. There are always a series of firing embrasures, or loopholes for firing through, usually stepped in to be narrowest on the inside of the box, and widest on the outside. This allows a maximum field of fire for the occupants and minimum access to incoming fire. The size of the loophole varies according to the size of the weapon to be fired through it (from rifles to anti-tank guns). Pillboxes are almost always of concrete construction, sometimes with brick shuttering, although some were camouflaged with stone facing. Earth was often used as camouflage, on the roof or to break up the outline of the walls. At the start of World War One in 1914, there were no effective defences at all in Norfolk. All existing forts had been dismantled except an obsolete battery in Great Yarmouth. The main reason for this stagnation was the Royal Navy, whose power at the time was such that it was not thought important to have coastal defensive installations. This attitude was dealt an early blow when, in November of the same year, the German Navy carried out a fast dash across the North Sea and shelled Yarmouth. Damage was light, but the incident raised fears of invasion and sparked a frenzied period of trench digging (for instance, Sheringham golf links were desecrated by a complex system of defence works). Also several coastal defence batteries were installed. Fears of a German invasion persisted throughout World War One, and from 1916, defence lines were strengthened by concrete pillboxes. In North Norfolk, these were made of concrete blocks and were circular (it was the circular type that gave the emplacement the name 'pillbox', resembling as it did a box used in the past for containing pills). These boxes were placed mainly in a line inland from Weybourne to Sea Palling, broadly along the seaward side of the course of the River Ant. 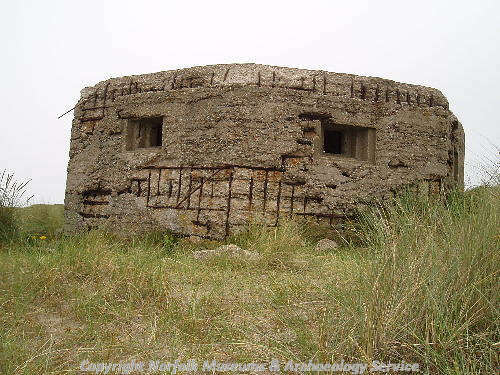 In South Norfolk, pillboxes were hexagonal, (the prototype of the most common type seen in World War Two) and were positioned to protect Yarmouth on its landward side (i.e. from overland attack). Of course the anticipated invasion never happened, and after the Armistice in 1918, all the field works and coastal batteries were abandoned. However, by and large, the pillboxes remained, although some were later demolished. 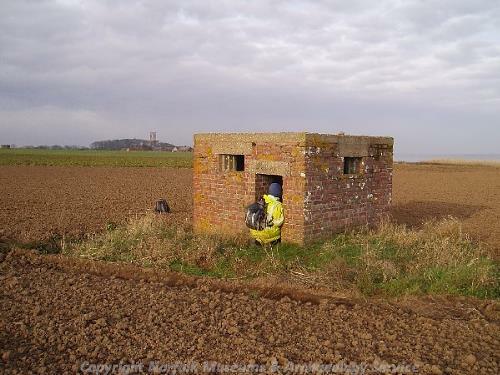 Today there are thirty one recorded World War One pillbox sites in Norfolk. Of these, seven have been demolished, and have been identified from earlier aerial photographs. The survivors are relatively rare, and some have been issued with Building Preservation Notices. The inter-war years (1919 to 1939) had seen the rapid development of the tank, a primitive version of which had first been used by the British in World War One. Tanks, together with other mechanised transport and air power, radically changed the way wars were fought. Therefore, when considering ground defences during World War Two, planners used pillboxes in association with a wide range of other defensive measures (see above), with stopping, destroying, or at least slowing tanks being a priority. On the outbreak of World War Two in 1939, the only defensive measure carried out immediately in Norfolk was the installation of a 6 inch gun battery in Yarmouth, as the prospect of invasion seemed remote. However, this complacency (which mirrored that felt at the start of World War One) was short-lived, and was replaced by alarm following the evacuation of the British Expeditionary Force (BEF) from Dunkirk in May/June 1940, and the fall of France shortly afterwards (it should be remembered that a huge amount of equipment was abandoned in the evacuation). Although it was deemed most likely that the Germans would land on the south coast, a secondary or diversionary attack on the East Anglian coastline was a distinct possibility. This prompted a massive defence fortification programme in the region. As usual, the coast and small ports were fortified, but for the first time since the Civil War, defence systems were constructed inland. Although the level of construction in Norfolk was huge, the overall defence plan was relatively simple. It differed from the 'vigorous counterstrokes' mentality of World War One, as the army was chronically short of tanks after Dunkirk. Instead, the plan was for a coastal 'crust' of defences, consisting of batteries, pillboxes, anti-tank obstacles, trenches, barbed wire, searchlights and mines, with successive lines of defence strengthening natural barriers further inland. Extra defences would defend important junctions, airfields and radar stations. There were five successive lines of defence inland, based along the rivers Ant, Bure, Wensum, Yare and Ouse. Norwich was surrounded by anti-tank obstacles supported by half a dozen pillboxes. The idea was that should the coastal crust be breached, further incursions into the county could be resisted or contained by successive 'stop lines', back to the main GHQ stop line. Mobile reserves would then be brought into action at concentrated points. Interestingly, in Norfolk, all those places recommended for fortification during the time of the Armada in 1588 were fortified in 1940, showing the continuity of defence strategy. After 1943 the threat of invasion receded, with Germany pouring resources onto the Eastern Front. Gradually, regular units in the defensive lines were replaced by the Home Guard, or reduced to 'care and maintenance' status. Work had already started to clear the beach defences of the coastal crust before the end of the war, and after Victory in Europe (VE) Day, the whole system was dismantled. However, emplacements (including pillboxes) were only demolished if they interfered with civic amenities and thus many pillboxes survive. 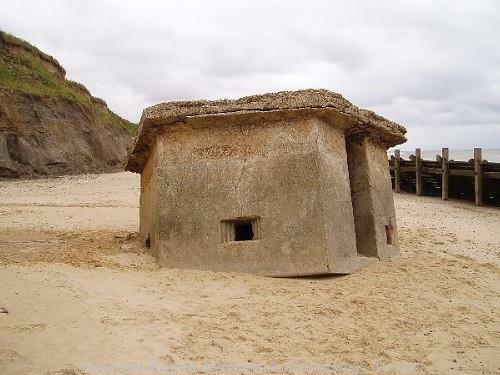 At the time of writing, there are some 672 World War Two pillboxes in Norfolk registered on the NHER database. Some of these are records from aerial photographs of demolished or destroyed (e.g. by coastal erosion) sites, but the majority survive. Space does not permit an exhaustive survey of all of these sites, but there follows a selective list of some of the more common types of World War Two pillboxes together with examples of where these are located in the county. 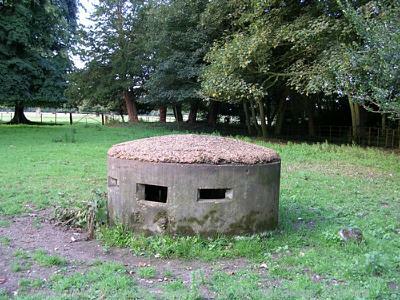 The commonest type of pillbox, the Type 22 is a regular hexagon in plan, with walls about 0.3m thick and 1.8 metres long. Each wall has a firing loophole, except that furthest from the expected direction of attack which has the entrance, sometimes protected by a blast wall. Internally there is a ‘Y’ shaped or cruciform wall to deflect ricocheting fire within the box. Rectangular, half roofed and half open, with an anti-aircraft weapon in the open section. Access by way of ladder in the open section. Walls 0.3m thick. Often found on or near airfields and radar stations. Irregular hexagon in plan, with the rear wall larger than the others, containing an entrance with firing loopholes on either side (usually). Walls are typically 0.3m thick, though many of this type have walls up to 0.9m thick. Circular and usually quite small with three firing loopholes spaced around it. Entrance often low down. Type 25’s were often built with corrugated iron shuttering, giving the exterior a distinct ridged finish. 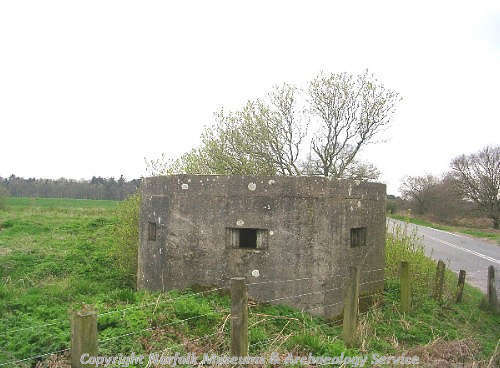 There are no type 25s registered in Norfolk on the database, but a circular pre-fabricated 'Norcon' (see below) pillbox can be seen at Kelling near Weybourne (NHER 24185). These are very rare. Square, walls are about 0.45m thick with one loophole per wall except for the entrance wall. Square in plan with 0.9m thick walls. One large gun port, with a large concrete “table” for the gun. Sometimes comes with 2/3 firing loopholes. Large blast wall protects the entrance. Octagonal, with an open central well for an anti-aircraft weapon. Walls are 0.9m thick, with one firing loophole per wall. 6.1m square, with walls 0.9m thick, the Type 28 was intended to emplace a field gun. It has a large entrance to accommodate the gun, and a large loophole to fire it through. Two smaller loopholes for infantry fire. 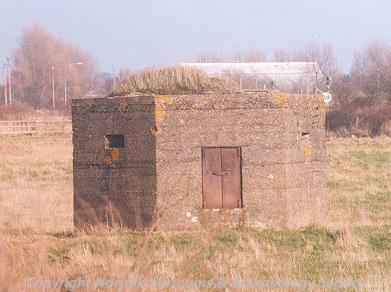 Other less common types of pillbox from this period include a pre-fabricated type called the Norcon (see above) and those boxes associated with airfield defence. One of these in particular is of interest – the Picket Hamilton fort. This was a sunken circular concrete pillbox which, when not in use, remained flush with the airfield’s surface, allowing movement of aircraft. In the event of attack however, the box could be manned and raised to give defending fire. Piet Aldridge (NLA), April 2005. 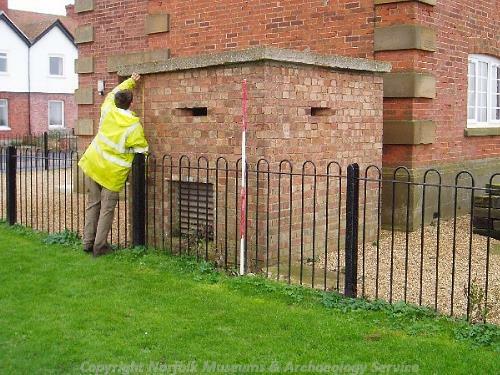 Bird, C., ‘Fixed Defences of Norfolk’ Norfolk Industrial Archaeology Journal Vol. 5 Nos. 1 and 2. Bird, C., ‘Fixed Defences of Norfolk’ Norfolk Industrial Archaeology Journal Vol. 5 No. 5. Lowry, B., 1986. 20th Century Defences in Britain. An Introductory Guide (London, Council for British Archaeology). 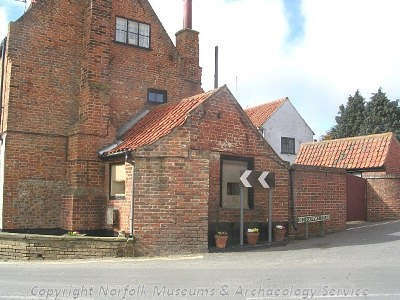 Wade-Martins, P. (ed) 1993, An Historical Atlas of Norfolk (Gressenhall, Norfolk Museums & Archaeology Service). Wills, H., 1985. Pillboxes. A Study of UK Defences 1940 (Leo Cooper in association with Secker and Warburg).